The 1992 USA Olympic Team, a.k.a The Dream Team, is known as the greatest collection of players on 1 team (excluding Christian Laettner of course). What I have in store for you is the real best collection of players on 1 team... the Ultimate NBA All-Time Team. The 6'9 PG, Earvin "Magic" Johnson, is the best PG of all-time and it's no doubt. Like his name, he was magical on the court. Apart from Oscar Robertson, Magic is the best all-around Guard of all-time. 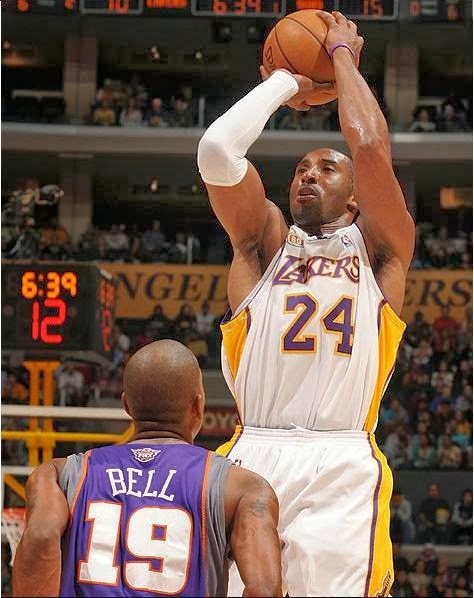 He led the Lakers to 5 NBA Championships, including winning the NBA Finals MVP 3 times. Johnson also won the MVP 3 times and has his number #32 retired among the Laker greats. Any team led by Magic Johnson is built for success. This was by far the easiest spot I had to choose. If the best player of all-time is a SG, it's a rather easy selection, wouldn't you say? MJ was as infamous as a player there was and will be. Retiring from basketball twice and coming back like nothing was different is no easy task and Jordan accomplished just that. 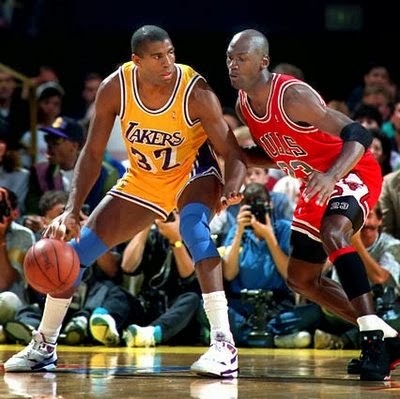 Even more than his offense, his defense was praised by many, including Jerry West who often says that "he was more impressed with Jordan's defensive contributors than his offensive ones". Jordan could be considered an even better defensive player than he was offensive and he was an outstanding offensive player, winning the Defensive Player of the Year award in 1987-88. Jordan would obviously be the one to trust in the dying moments of a game. LeBron James is only 28 and he's already the best SF of all-time. Yeah, I said it; LeBron James is the best SF of all-time. He already has 4 MVP awards, a near Defensive Player of the Year award and future Defensive Player of the Year award coming, and has already won 2 NBA Championships. Ever since coming to the Heat, he has became an even better player. I mean, just look at his shooting line: 57/41/75. He's always been an average FT shooter but 41% from deep is amazing and 26.8 PPG on 57% from the field? Now that's what you call efficiency. On this team, LeBron wouldn't have to carry the team in scoring and he would be able to focus more on shutting down the opposing team's SF and taking advantage of his ultra-versatile game. I know Hakeem Olajuwon is a Center (I think he's the best Center in NBA History) but his offense gives him the ability to play the 4 and 5. He did play PF sometimes when the 7'4 Ralph Sampson was on the team and did amazing while doing so. Hakeem "The Dream" is known to have the greatest post-repertoire and footwork in NBA History but people seem to forgot about his defense. He has the most blocks in NBA History with 3,830, including averaged 4.6 BPG in a season. 4.6 BPG is just unheard of in the NBA. 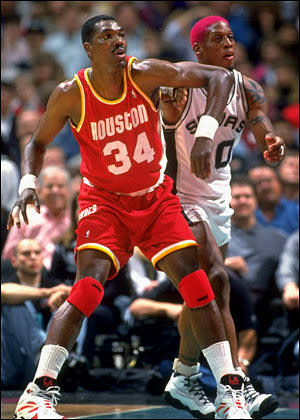 Hakeem has won 2 Defensive Player of the Year awards (1992-93 and 1993-94) and was the 1st person in NBA History to win the DPOY, MVP and NBA Finals MVP in a single season, in 1993-94. His patented "Dream Shake" move was deadly and is no one has ever been able to pull it off like he did. If people are worrying the spacing with Hakeem playing PF, I must remind you that he has range on his jumper. He can go out to 16 feet and nail the mid-range shot. 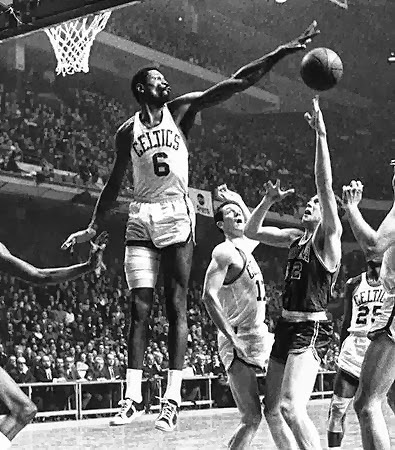 Bill Russell wouldn't be asked to score at all, except for put backs, and he could solely focus on what he's best at, and that is defense. Kobe Bryant is not necessarily the 6th best player in NBA History but he is however the best fit from these selection of players to be a 6th man. Kobe's ability to light up the scoreboard and score is second to none. He's the 2nd best SG of all-time, although Jerry West probably has something to say about that. Any team would love to have a 5-time NBA Champion and 1 time MVP winner, whose made countless shots to carry his team to victory. Say if this team is getting blown out (highly unlikely and what I mean by highly unlikely is that it's not gonna happen... ever) and Magic or Jordan are getting rest, Kobe would be a prime candidate to pull his team back into the game and to victory. Oscar "Big O" Robertson is the only NBA player to ever average a triple-double throughout the whole season and that reason alone puts him among the greatest players of all-time. He may of averaged a triple-double in "only" one season but he was close on a couple more seasons, missing it by 0.1 RPG in one season and 0.3 APG another season. If you put together his 1st 5 NBA seasons, his numbers look like: 30.3 PPG, 10.4 RPG and 10.6 APG. Those numbers are absolutely absurd when you consider the fact that Oscar Robertson didn't play in the 3-point era. I honestly think he could easily be considered the best PG of all-time over Magic Johnson and Tru School Sports' own, Brendan Taylor, even says that's he's the best of all-time. Magic and Robertson are similar players so you'd be getting 110% effort and production for the full 48 minutes. 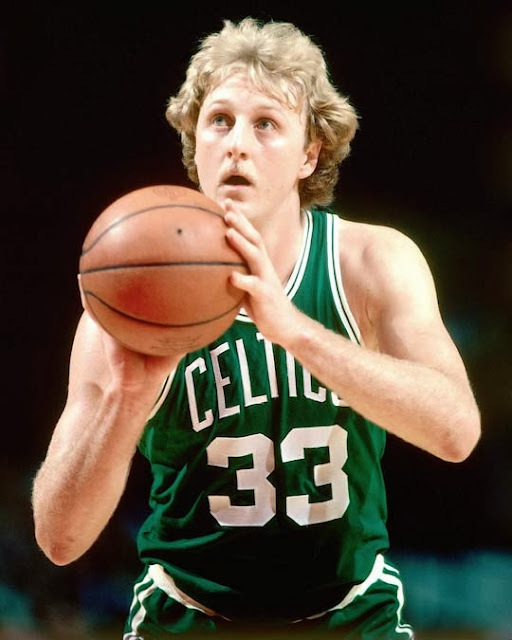 Known as one of the greatest shooters of all-time, Larry Bird did not disappoint during his career with the Celtics, having a shooting line of 50/38/89. Larry won 3 NBA Championships in a career shortened by injuries. He was more of an all-around player than people think and his stats are proof of that. Whenever this team's offense needs spacing or needs a quick 3, it's Bird they call too (bird call, get it?). I will go out on a limb here and say that Tim Duncan, a.k.a, "The Big Fundamental", is the best PF of all-time and he still has a couple seasons left in him. Duncan Donuts has been a consistent 20-10-2 player for the majority of his career and in the later parts of his career, has become a 17-9-2 player (great numbers for a player his age). From his patented bank-shot to his defensive tenacity, Timmy D has been everything the Spurs could've wanted him to be and more, leading them to 4 NBA Championships, becoming a dynasty along the way. He definitely is a 1st-ballot Hall of Famer and will be in, in his 1st year of eligibility. On this team, he can be the starting PF, no doubt. I just preferred a 4-5 combo of Hakeem and Russell. 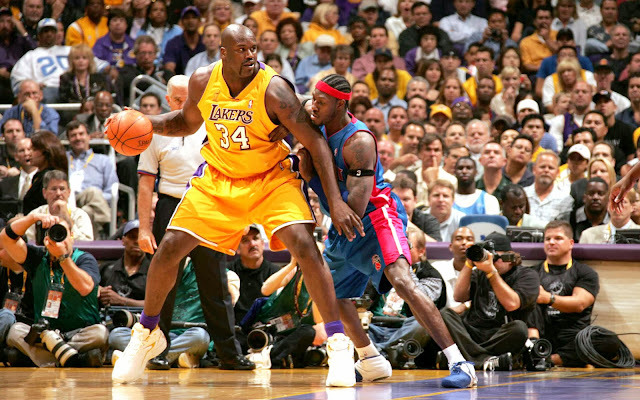 Who's the most physically dominating Center in NBA History? 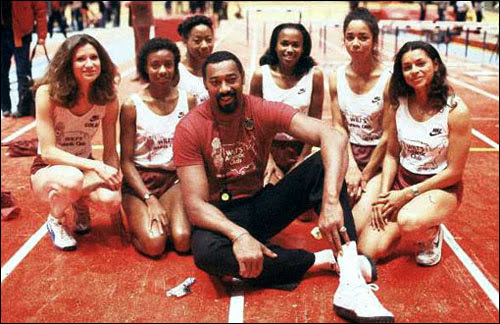 Wilt Chamberlain? No. David Robinson? Hell no, he was way too nice. It's Shaquille O'Neal for the folks that didn't know. Ever since he entered the league in 1992-93 till midway through his Miami Heat days (2004-05), Shaq was the most physically dominating presence in the NBA and it's a no-brainer. Shaq is not a better Center than Wilt Chamberlain or Kareem Abdul-Jabbar but if I were to choose a Center to play around 20 minutes a game and they would give everything they got during those 20 minutes, it'd be Shaquille O'Neal. Before stamina issues kicked in, Shaq could play 40 minutes a game, every game, and play like he'd only played 10 minutes. 20 minutes of Shaq in his prime, give me. 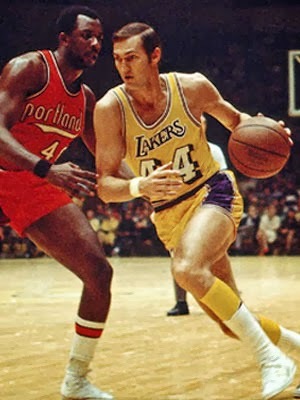 Jerry West, the original "Mr. Clutch", could be considered the 2nd best SG of all-time but that's a debate for another article (wink wink, nudge nudge). He scored nearly 30 PPG in his prime before the 3-point era was introduced and that's absolutely absurd for a Guard, back in the 60's. Imagine how Jerry West would've been with the 3-pointer. For his career, he scored 27 PPG on only 9.7 shots per game. However absurd those numbers were, times then by 2. Not only his offense but he was so slacker on D either, being one of the premier defenders of his time and one of the best all-time. If Kobe or Jordan were to go down with an injury, the original Mr. Clutch would take their spots and possibly the game tying/winning shot. After all, he is called Mr. Clutch right? Like Shaq, Charles Barkley is arguably the most physically dominating Forward to play the game and I certainly believe so. I mean, Barkley was a 6'6 PF (he considered himself closer to 6'4/6'5) and he averaged 11.7 RPG for his career. That is a ludicrous amount of rebounds per game for a 6'6 PF. He may of been smaller than every other PF or C (literally), but he still was one of the most feared players to play against. Other than his rebounding, his scoring was even better than, averaging 28.3 PPG in one season. 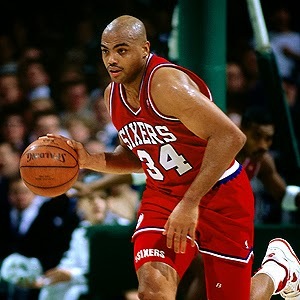 If I needed some grit and toughness, with the ability to score, I'd definitely call on Charles Barkley. Before you freak out and ask me why I don't have Isaiah Thomas on the Ultimate NBA All-Time Team, let me tell you that I already have so many primary ball-handlers on this team that I don't need another one. I mean, I already have Magic Johnson, Oscar Robertson, LeBron James, Michael Jordan and Kobe Bryant. 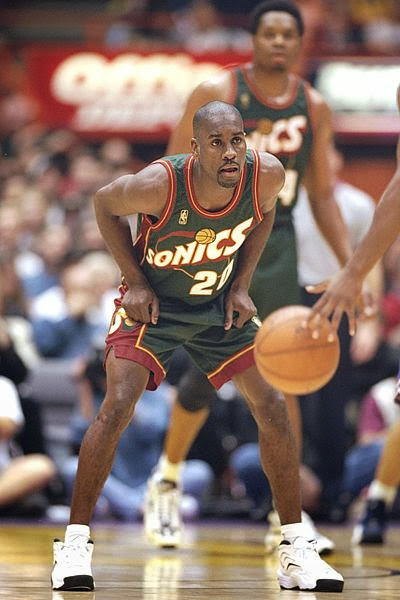 Because of that, I decided to go with Gary "The Glove" Payton, known for his defensive prowess and is the only other Guard other than Michael Jordan, to win the Defensive Player of the Year award, as he did in 1995-96, averaging 2.9 SPG. If there's one thing I'm focusing on, on this team is that I want most, if not all, of my players to be tough and gritty and that pretty much sounds like Gary Payton to me. For my reserve forward spot, I had to choose from either Elgin Baylor or Julius Erving and as you can tell, I chose Elgin. Why? Well, both players had somewhat similar stats, however Baylor is the better rebounder and Erving is the better defender. 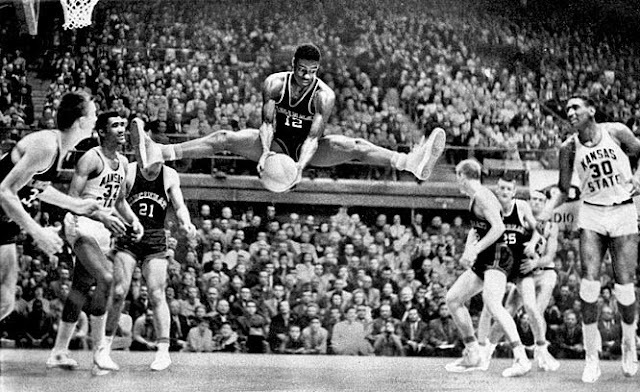 The main reason why I chose Elgin over Julius is that Elgin was the 1st athletic freak that the NBA had ever seen. He was 6'5 and grabbed 13.5 RPG over his career. 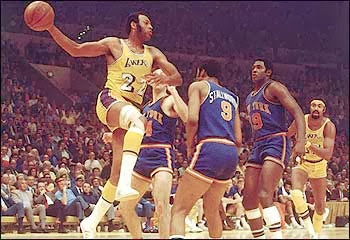 Also, Elgin Baylor was the better scorer as well, evident by his 27.4 PPG average.On this team, Elgin Baylor is a spark of offense or rebounding help, off the bench as well. How could I not include "The Big Dipper" as he likes to be known. Wilt Chamberlain, arguably the most dominant big man in terms of skill, is the final piece to the puzzle of the Ultimate NBA All-Time Team. I chose him over Kareem Abdul-Jabbar because in limited playing time, Wilt is more likely to make an impact in the game than Kareem. 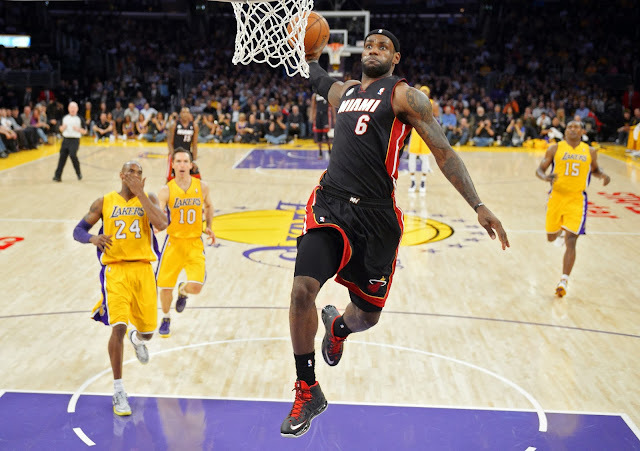 You just cannot ignore averaging 50.4 PPG in a single season and scoring 100 points in an NBA game. Wilt Chamberlain would've been even more dominant in the 3-point era, as he he could've used his underrated passing and kicked the ball out to the wide open person in the corner (there always was with Wilt getting tripled-teamed like no tomorrow). For the first time ever, the term "just a big body on the bench", will be associated with Wilt Chamberlain. Sounds rather strange doesn't it? 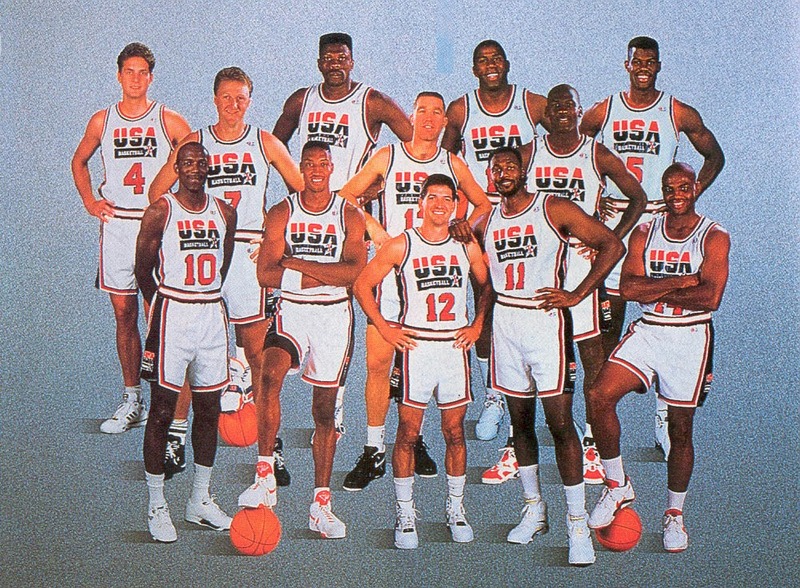 I know I have left many of the greatest players of all-time that certainly deserve to be on this team but according to me, this is The Ultimate NBA All-Time Team. Comment below on who you think is on the All-Time NBA Team and who you think got snubbed. Why isn't Brian Scalabrine on this team? Oh my god... how could I forget?! I am a horrible person. Can't agree with Kareem not being on here. He's easily top 10 of all-time, to say the least. The thing is, I already had Hakeem, Russell, Shaq and Duncan playing the main 4 and 5 minutes so I had to choose between Wilt or Kareem for a couple minutes a game and Wilt can have much more of an impact in those couple minutes. Not discrediting Kareem, he's amazing.